MEDTEQ has developed an 8 channel temperature measurement system specifically for measuring temperatures around the human body range, where low margins between the measured temperature and the allowable limit can demand a higher accuracy and resolution than standard laboratory equipment. 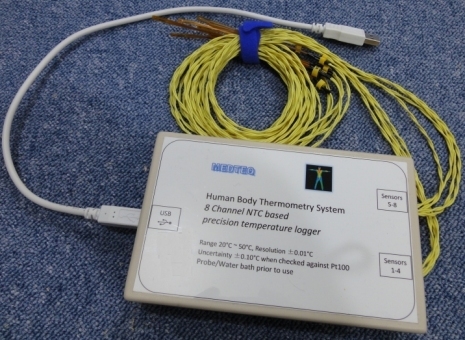 With a small sensor size, resolution of 0.01°C and an overall measurement uncertainty of 0.2°C over a range from 10 to 50°C, the Human Body Thermometry system (HBTS) is suitable for measurements of applied part temperatures (endoscopes, ultrasound probes, pulse oximetry and many others), and also for systems that control temperature such as infant incubators, infant radiant warmers, dialysis systems and more. The sensor is an NTC thermistor (same type as used in medical systems), and a specially designed combination of parallel resistance with 3rd order polynomial fitting has been used to ensure highly accurate measurement over the moderate range. During production, each sensor of the HBTS is individually calibrated to within 0.02°C against precision Pt100 probe in a circulating waterbath. Calibration co-efficients are stored in the firmware of each unit. 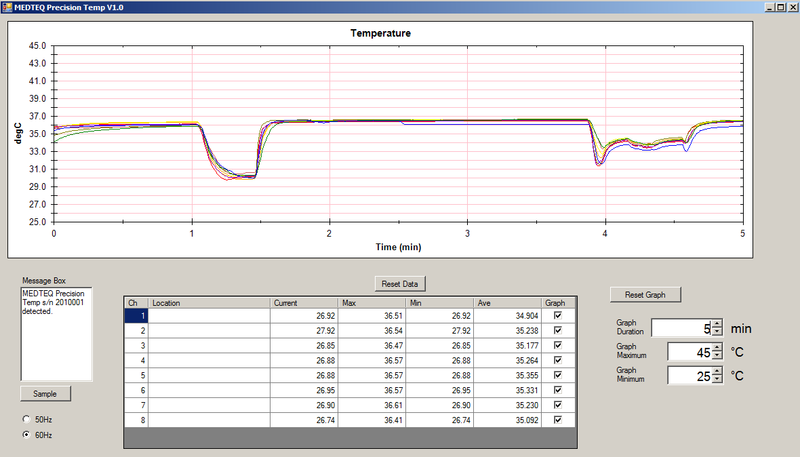 The PC based software allows the user to view the plot of temperature with time, and stores the minimum, maximum and average values of temperature for each channel. Both the graph and data are easily copied for transfer into test reports or other test records. Although each channel is individually adjusted by MEDTEQ to within 0.02°C against a precision Pt100 probe, for ISO 17025 traceability, the system should be formally calibrated by the user. For a fee, MEDTEQ can arrange for calibration in Japan at JQA prior to release.